Increase your body awareness and learn to relax - for physical and emotional balance. Secret Elements Qi Gong is a Qi Gong, Self-Balance & Therapy method developed by international teacher Sascha Wagener and well-known German Kinesiologist Martin Nienhaus. It connects the ancient knowledge of Chinese Qi Gong & medicine with modern research from Kinesiology and Psychology. As a compact self-help tool it empowers people to balance their physical and emotional state and actively take their health and happiness in their own hands. Now taught around the world it enriches the toolbox of many therapists, Yoga teachers & people interested in their own holistic health preservation. The basic teacher education deals with the 5 fundamental Secret Elements Qi Gong exercise sets. You will learn to conduct Qi Gong classes and correctly execute the movements as well as facilitate visualisations and additional exercises. After the seminar you can use the Qi Gong for your own self healing and balancing or to teach group courses. The Krishna Village can host up to 60 people in a combination of rooms, dorms and camping spots. 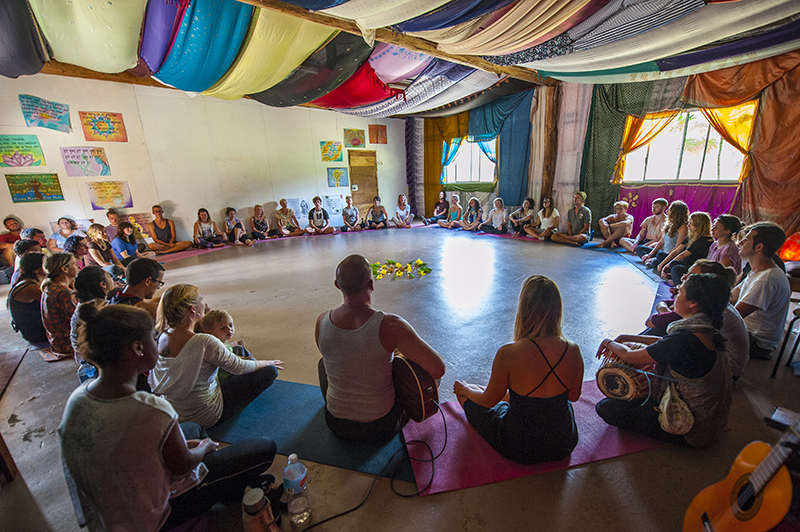 There are usually around 25 full time volunteers who work in our organic gardens and maintain the grounds, 20 Yoga Teacher trainees, 10 long term community members and 15-25 retreat guests or Karma Yogis. While staying with us, you will have 3 delicious vegetarian meals provided every day, with breakfast and lunch raw food options.